Every year around this time, there’s a buzz about a certain shortlist of Canadian prose. Nationally, five books are selected. Libraries order multiple copies but can’t keep them. Bookstores carry them at 30% off. Canadians, you see, are preparing for the annual “Canada Reads,” in which selected panelists each champion one of the books, and then battle it out — book battle style — over four or five days, and CBC broadcasts the whole thing to the nation. Now, prior to this year, “Canada Reads” had admittedly been one of those cultural customs that I’ve been deeply proud of (such a culturally literate country Canada is!) while simultaneously only being obscurely aware that it’s happening. I’ve approved of it from a distance, you might say. I’ve never tuned in to the CBC on purpose to listen to the book battle; rather, I’ve heard snippets of it, over the years, by chance while listening in the car or working at the antiquarian bookstore where they played the CBC. Indeed, the only definitive thing I could tell you about previous Canada Reads without looking it up online is that, one year, Ami McKay won for The Birth House. I remembered this when I heard it because I’d actually read the book, years ago, before it had gotten big (and I actually met her one evening at an intimate reading in the basement of a library out East), had bought her book and felt that, in some way, I had shared in the book’s success. Canada Reads is one of those things you always mean to do, but don’t. Of course, I’ve had the best of intentions that, one of these years, I’ll read the books and then listen in. And then I’m vaguely conscious of the battle airing — and passing — and meanwhile I’ve not read one of that year’s selections. My local library was having their own edition of “Canada Reads 2018” using the same books, and holding it a week or so before of the national one. I’d seen the event advertised for weeks in the foyer of my local library, with the catchy pitch: “Come hear five librarians battle it out to defend their chosen book from this year’s shortlist,” with cut-outs of the covers from each of the books posted to the board. This year, this year, I’ll do it! I would tell myself every time I walked by that board. I decided I would read one this year. Out of the five books on the shortlist — The Boat People by Sharon Bala, American War by Omar El Akkad, Precious Cargo by Craig Davidson, Forgiveness by Mark Sakamoto, and The Marrow Thieves by Cherie Dimaline — two of them were creative nonfiction. Between Forgiveness and Precious Cargo, the latter had the shorter library wait time, but I still wouldn’t get it in time if I went by the due dates. I chose it, anyhow, put my name on the list, hoped for the best, and got lucky. So yesterday, I showed up my local library’s edition of Canada Reads, book in purse. I’d finished Precious Cargo only that morning, on a day that decided it was winter again, and I arrived a few minutes late, only to discover that the panelist who was defending Precious Cargo had already said her piece and the next panelist was being introduced. Of course I kicked myself for having missed the talk on the one book I’d read, but as I listened to the others, I took note of the book battle’s format: first, a panelist presented one’s book, detailing why it deserves to be the winner, heralding its good points, talking about its relevance to Canadian history and culture, reading a short passage, and then declaring why Canadians should read it and why it should win. Each librarian panelist went down the line and gave her presentation of her book (they all happened to be women). As I listened to them, I realized that all of them dealt with extremely heavy subjects; they were serious books with great historical and cultural relevancy. (And I found it strange that there was a book called American War in a Canada Reads shortlist, a book which its defending librarian said was speculative fiction.) It became clear that out of the five, Precious Cargo was the only book told from an everyday perspective — it makes you feel it could have been anyone — looking introspectively at his world, and the world around him. It was the only one that focused on everyday people in everyday circumstances — the kids on the bus and Davidson driving them. There was another round of questions, one specific to each book. 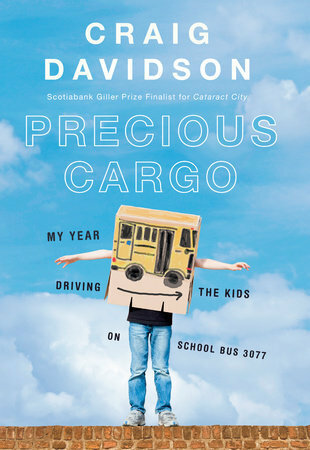 Precious Cargo‘s was about the relevancy of several of its chapters, taken from an unpublished novel by Davidson which were interspersed throughout the book. Now, I had found these chapters jarring myself, as we’re given no context to them and only by the end do we figure out that Davidson had previously written a fantasy fiction about the kids he had driven and then included selections in his memoir. The librarian answered, defending the inclusion of these chapters in the book, but if I had been in a writing workshop with Davidson when he was writing Precious Cargo, I would have told him to cut those chapters entirely. They were too distracting and confusing. Next up, was to name a weakness in the book, and last, was the chance for each librarian to choose one of the books they would remove from the list. Then they opened it up to questions from the audience. The librarian defending Precious Cargo said that the book’s weakness was that it wasn’t “good writing.” I wanted her to explain a bit more what she meant by that. Yes, I’d had similar thoughts when reading – that the writing wasn’t exactly the pinnacle of literary perfection. But then I also conceded that perhaps I had a high standard from reading so much literary fiction and creative-nonfiction, and had often found I’d had the same criticism when reading most other literature of the day. What she did say was that the writing was “extremely thoughtful.” Davidson is profoundly reflective about his experience: he’s not just telling us what happened; he’s also telling us what he thought about it then, and now, as he’s writing it. He writes how he changes how he views the kids, their disabilities, and his own reactions to others about his bus. To me, that is where the literary strength is in the book, along with his ability to give insights into the different personalities of each of the five of the kids on his bus, and give us everyday scenes with the kids and. He also gives us a good portrayal of himself; his shortcomings and foibles, and earnest thoughts – a very relatable character. What I would say the book’s one weakness is (other than the need to scrap the Seekers chapters) is that we are missing specifics into the rest of Craig’s life during the time he drove the bus. He tells us how he has changed in regards to his feelings towards the kids and how he thinks differently about disability. But we don’t get the rest of his life in any kind of significant detail, other than vague generalities about his failure as a writer and being somewhat socially inactive at the moment. What I wanted to know is how him knowing the kids changed his life outside of the time he spent with them. The book is funny, lighthearted, as well as touches on some deep subjects and wounds — of both him and the kids. But serious subjects don’t need to necessarily be seriously written about all the time; I feel like Davidson balanced it well. It this way, it was a fun, and enjoyable read. It was fun to be part of the kids on the bus, and Davidson’s experience of it. During the “pick one book you’d disqualify,” one of the other librarians chose Precious Cargo, saying she’d “heard the writing wasn’t very good” and dismissed it on those grounds. (I’d been afraid someone would disqualify it because it was about everyday life, but no.) The librarian defending Precious Cargo, by way of defense, responded, “It’s a memoir!” as if its genre excused it from being “good” literature. I later was going to ask her what she meant by that during the audience question period, but thought better of it. Now I think I wish I had. At the end, we all voted on which book had been best presented/ defended (it happened to be Precious Cargo), and while they counted up the ballots, they drew tickets for each of the books to give to the audience. I happened to win one, The Boat People by Sharon Bala. Perhaps I’ll read two book by the time the national Canada Reads airs this year, after all! Question: What “everyday life” memoir have you enjoyed reading? But I did want to mention that I think it’s interesting how, unless our experience with a book is negative, we tend to esteem books we have read above those we haven’t. I remember reading Ella Enchanted the year it won the Newbery, and somehow the fact it was the one I read, with all the bits I loved in it, led me to assume (in my childlike state, perhaps) that it was more worthy of winning than the other candidates, or at least, that there was something to be gained for rooting for it, even though I had not read the other books. Perhaps it is related to the connection between the synopses of the books we consider reading and our own inclinations and biases, but then, perhaps we exercise a quiet pride in having read, and want our taste in books to be acknowledged by others’ estimation, if even in subtle ways. What an astute observation! I think you’re right about “esteeming books we have read above those we haven’t.” I had the vague feeling during the book battle at the library that perhaps I was championing *Precious Cargo* in part because I had read it (as if that was a reason for it being worthy of winning!). And yes, I had chosen it because it was one of the two books of creative nonfiction, so already I was biased in which book I chose to read of the five. I love what you wrote about wanting our “taste in books to be acknowledged,” – when *Precious Cargo* won, I was, admittedly, surprised, but also elated, perhaps because it wasn’t just me! I wonder if I’d read *Forgiveness,* the other CNF book, and it had won, if it would have been a similar experience for me (I am inclined to think yes). Yes, *The Birth House* is wonderful, isn’t it? It was the strangest but most delightful *reading* I’ve ever been to. Ami McKay read passages, as is usual for a reading, but then during the Q&A time, it became more of a discussion, with the audience contributing to a lot of it, talking about midwifery. People telling their own stories, connecting with the writer on a very personal level. It was beautiful! Glad you enjoyed reading it so much! Wow, that’s hard, to choose just *one* Canadian book! I’ve been thinking about it, and have narrowed it down, though not quite to one! I know you love reading L.M. Montgomery (as do I!) so I won’t give you one of her many novels. But, I’m wondering have you ever read her journals? They were published first as the *Selected Journals* but in the 2012 the first volume of her *Complete Journals* came out and it’s fantastic (I’m reading it now, having read all of her Selected Journals several years ago). It’s journal-format, but carefully crafted, literary even. Great if you want a glimpse into Montgomery’s own life. I thoroughly enjoyed reading Ami McKay’s *The Birth House* which I’d mentioned in the post (though I think she’s not strictly Canadian). It takes place on Canada’s East Coast and is about women and midwifery and I think loosely based off one of her relatives, though it is fiction. Wayne Johnston’s memoir *Baltimore’s Mansion* was beautifully written — about three generation of fathers and sons in Newfoundland (there’s a beautifully opening scene with an iceberg). And lastly, I would recommend anything by or about Susanna Moodie or Catherine Parr Traill; they were two English sisters who immigrated to Canada in the 1800s to settle in the bush with their husbands and families; Moodie wrote *Roughing It in the Bush* (a Canadian Classic). Also, our contemporary, Charlotte Grey, has written a beautiful biography (that includes a lot of history) about Moodie and Traill called *Sisters in the Wilderness. * So, I’ve given you a bit of a list, which is more than you asked for, I know. But you have a choice depending on what you feel like!